In response to this post from Chelsea Manning, the other day I did the first in what seems to have become a series of posts arguing that we should eliminate the FISA Court, but that the question is not simple. In that post, I laid out the tools the FISC has used, with varying degrees of success, in reining in Executive branch spying, especially in times of abuse. In this post, I want to lay out how reining in surveillance isn’t just about whether the secret approval of warrants and orders would be better done by the FISC or a district court. It’s about whack-a-mole. The government uses the FISA court to get individualized orders for surveillance in this country and, to a less clear extent, surveillance of Americans overseas. That’s the old-fashioned stuff that could be done by a district court. But it’s also one point where egregious source information — be it a foreign partner using dubious spying techniques, or, as John Brennan admitted in his confirmation hearing, torture — gets hidden. No defendant has ever been able to challenge the basis for the FISA warrant used against them, which is clearly not what Congress said it intended in passing FISA. But given that’s the case, it means a lot of prosecutions that might not pass constitutional muster, because of that egregious source information, get a virgin rebirth in the FISC. In addition, starting 2004, the government started using the FISA Court to coerce corporations to continue domestic collection programs they had previously done voluntarily. As I noted, while I think the FISC’s oversight of these programs has been mixed, the FISC has forced the government to hew closer (though not at) the law. The executive branch considers FISA just a subset of EO 12333, the Reagan Executive Order governing the intelligence community — a carve out of collection requiring more stringent rules. At times, the Intelligence Community have operated as if EO 12333 is the only set of rules they need to follow — and they’ve even secretly rewritten it at least once to change the rules. The government will always assert the right to conduct spying under EO 12333 if it has a technical means to bypass that carve out. That’s what the Bush Administration claimed Stellar Wind operated under. And at precisely the time the FISC was imposing limits on the Internet dragnet, the Executive Brach was authorizing analysis of Americans’ Internet metadata collected overseas under SPCMA. EO 12333 derived data does get used against defendants in the US, though it appears to be laundered through the FISC and/or parallel constructed, so defendants never get the opportunity to challenge this collection. Even when the government goes to a Title III court — usually a magistrate judge — to get an order or warrant for surveillance, that surveillance often escapes real scrutiny. We’ve seen this happen with Stingrays and other location collection, as well as FBI hacking; in those cases, the government often didn’t fully brief magistrates about what they’re approving, so the judges didn’t consider the constitutional implications of it. There are exceptions, however (James Orenstein, the judge letting Apple challenge the use of an All Writs Act to force it to unlock a phone, is a notable one), and that has provided periodic checks on collection that should require more scrutiny, as well as public notice of those methods. That’s how, a decade after magistrates first started to question the collection of location data using orders, we’re finally getting circuit courts to review the issue. Significantly, these more exotic spying techniques are often repurposed foreign intelligence methods, meaning you’ll have magistrates and other TIII judges weighing in on surveillance techniques being used in parallel programs under FISA. At least in the case of Internet data, that may even result in a higher standard of scrutiny and minimization being applied to the FISA collection than the criminal investigation collection. Up until 2006, telecoms willing turned over metadata on Americans’ calls to the government under Stellar Wind. Under Hemisphere, AT&T provides the government call record information — including results of location-based analysis, on all the calls that used its networks, not just AT&T customers — sometimes without an order. For months after Congress was starting to find a way to rein in the NSA phone dragnet with USA Freedom Act, the DEA continued to operate its own dragnet of international calls that operated entirely on administrative orders. Under CISA, the government will obtain and disseminate information on cybersecurity threats that it wouldn’t be able to do under upstream 702 collection; no judge will review that collection. Until 2009, the government was using NSLs to get all the information an ISP had on a user or website, including traffic information. AT&T still provides enhanced information, including the call records of friends and family co-subscribers and (less often than in the past) communities of interest. These six examples make it clear that, even with Americans, even entirely within the US, the government conducts a lot of spying via administrative orders and/or voluntary cooperation. It’s not clear this surveillance had any but internal agency oversight, and what is known about these programs (the onsite collaboration that was probably one precursor to Hemisphere, the early NSL usage) makes it clear there have been significant abuses. Moreover, a number of these programs represent individual (the times when FBI used an NSL to get something the FISC had repeatedly refused to authorize under a Section 215 order) or programmatic collection (I suspect, CISA) that couldn’t be approved under the auspices of the FISC. All of which is to say the question of what to do to bring better oversight over expansive surveillance is not limited to the short-comings of the FISC. It also must contend with the way the government tends to move collection programs when one method proves less than optimal. Where technologically possible, it has moved spying offshore and conducted it under EO 12333. Where it could pay or otherwise bribe and legally shield providers, it moved to voluntary collection. Where it needed to use traditional courts, it often just obfuscated about what it was doing. The primary limits here are not legal, except insofar as legal niceties and the very remote possibility of transparency raise corporate partner concerns. We need to fix or eliminate the FISC. But we need to do so while staying ahead of the game of whack-a-mole. Man, at some point Congress is going to have to declare the FBI legally contemptuous and throw them in jail. They continue to refuse to cooperate with DOJ’s Inspector General, as they have been for basically 5 years. But in Michael Horowitz’ latest complaint to Congress, he adds a new spin: FBI is not only obstructing his investigation of the FBI’s management impaired surveillance, now FBI is obstructing his investigation of DEA’s management impaired surveillance. I first reported on DOJ IG’s investigation into DEA’s dragnet databases last April. At that point, the only dragnet we knew about was Hemisphere, which DEA uses to obtain years of phone records as well as location data and other details, before it them parallel constructs that data out of a defendant’s reach. But since then, we’ve learned of what the government claims to be another database — that used to identify Shantia Hassanshahi in an Iranian sanctions case. After some delay, the government revealed that this was another dragnet, including just international calls. It claims that this database was suspended in September 2013 (around the time Hemisphere became public) and that it is no longer obtaining bulk records for it. According to the latest installment of Michael Horowitz’ complaints about FBI obstruction, he tried to obtain records on the DEA databases on November 20, 2014 (of note, during the period when the government was still refusing to tell even Judge Rudolph Contreras what the database implicating Hassanshahi was). FBI slow-walked production, but promised to provide everything to Horowitz by February 13, 2015. FBI has decided it has to keep reviewing the emails in question to see if there is grand jury, Title III electronic surveillance, and Fair Credit Reporting Act materials, which are the same categories of stuff FBI has refused in the past. So Horowitz is pointing to the language tied to DOJ’s appropriations for FY 2015 which (basically) defunded FBI obstruction. Only FBI continues to obstruct. There’s one more question about this. As noted, this investigation is supposed to be about DEA’s databases. We’ve already seen that FBI uses Hemisphere (when I asked FBI for comment in advance of this February 4, 2014 article on FBI obstinance, Hemisphere was the one thing they refused all comment on). And obviously, FBI access another DEA database to go after Hassanshahi. So that may be the only reason why Horowitz needs the FBI’s cooperation to investigate the DEA’s dragnets. Plus, assuming FBI is parallel constructing these dragnets just like DEA is, I can understand why they’d want to withhold grand jury information, which would make that clear. Still, I can’t help but wonder — as I have in the past — whether these dragnets are all connected, a constantly moving shell game. That might explain why FBI is so intent on obstructing Horowitz again. Last week, Dustin Slaughter published a story using a new deck of slides on the Hemisphere program, the Drug Czar program that permits agencies to access additional telecommunications analytical services to identify phones, which then gets laundered through parallel construction to hide both how those phones were found, as well as the existence of the program itself. 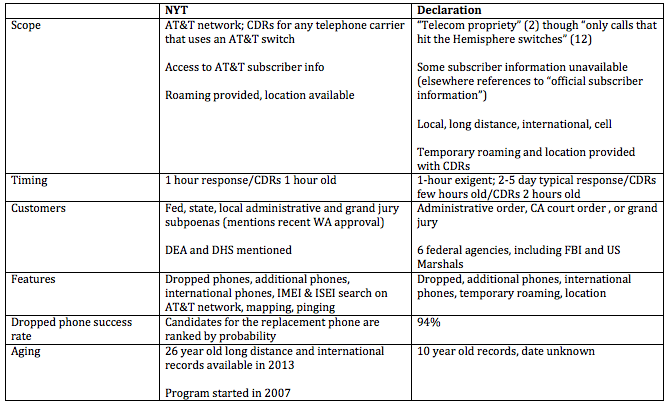 The biggest difference is that the NYT deck — which must date to no earlier than June 2013 — draws only from AT&T data, whereas the Declaration deck draws from other providers as well (or rather, from switches used by other providers). In addition, the Declaration deck seems to reflect approval for use in fewer states (given the mention of CA court orders and the recent authorization to use Hemisphere in Washington in the AT&T deck), and seems to offer fewer analytical bells and whistles. Thus, I agree with Slaughter that his deck predates — perhaps by some time — the NYT/AT&T deck released last year. That would mean Hemisphere has lost coverage, even while it has gained new bells and whistles offered by AT&T. From 2002 to 2006, the FBI had telecoms onsite to provide CDRs directly from their systems (the FBI submitted a great number of its requests without any paperwork). One of the services provided — by AT&T — was community of interest tracking. Presumably they were able to track burner phones (described as dropped phones in these decks) as well. In 2006, FBI shut down the onsite access, but retained contracts with all 3 providers (AT&T, Verizon, and probably Sprint). In 2009, one telecom — probably Verizon — declined to renew its contract for whatever the contract required. AT&T definitely still has a contract with FBI, and in recent years, it has added more services to what it offers the FBI. It’s possible the FBI multi-provider access moved under ONCDP (the Drug Czar) in 2007 as a way to retain its authorities without attracting the attention of DOJ’s excellent Inspector General (who is now investigating this in any case). Though I’m not sure that program provided the local call records the deck at least claims it could have offered. I’m not sure that program got to the telecom switches the way the deck seems to reflect. It’s possible, however, that the phone dragnet in place before it was moved to Section 215 in 2006 did have that direct access to switches, and the program retained this data for some years. The phone dragnet prior to 2006 and NSL compliance (which is what the contracts with AT&T and one other carrier purportedly provide now) are both authorized in significant part (and entirely, before 2006) through voluntary compliance, per David Kris, the NSA IG Report, and the most recent NSL report. That’s a big reason why the government tried to keep this secret — to avoid any blowback on the providers. In any case, if I’m right that the program has lost coverage (though gained AT&T’s bells and whistles) in the interim, then it’s probably because providers became unwilling, for a variety of reasons (and various legal decisions on location data are surely one of them) to voluntarily provide such information anymore. I suspect that voluntary compliance got even more circumscribed with the release of the first Horizon deck last year. Which means the government is surely scrambling to find additional authorities to coerce this continued service. The new phone dragnet neither requires “warrants” (the standard for an order is reasonable suspicion, not probable cause), nor does it require its orders to be tied to “individuals,” but instead requires “specific selection terms” that may target facilities or devices, which in the past have been very very broadly interpreted. All that said, I am interested in Rogers’ claims Sanger repeats about NSA’s changing relationship with telecoms. Sadly, here’s where Sanger’s unfamiliarity with the details makes the story less useful. Publicly, at least, AT&T and Verizon have had significantly different responses to the exposure of the dragnet (though that may only be because Verizon’s name has twice been made public in conjunction with NSA’s dragnet, whereas AT&T’s has not been), and it’d be nice if this passage probed some of those details. Telecommunications businesses like AT&T and Verizon, and social media companies, now insist that “you are going to have to compel us,” Admiral Rogers said, to turn over data so that they can demonstrate to foreign customers that they do not voluntarily cooperate. And some are far more reluctant to help when asked to provide information about foreigners who are communicating on their networks abroad. It is a gray area in the law in which American courts have no jurisdiction; instead, the agency relied on the cooperation of American-based companies. Last week, Verizon lost a longstanding contract to run many of the telecommunications services for the German government. Germany declared that the revelations of “ties revealed between foreign intelligence agencies and firms” showed that it needed to rely on domestic providers. After all, under Hemisphere, AT&T wasn’t requiring legal process even for domestic call records. I think it possible they’ve demanded the government move Hemisphere under the new phone dragnet, though if they have, we haven’t heard about it (it would only work if they defined domestic drug dealer suspects as associated with foreign powers who have some tie to terrorism). Otherwise, though, AT&T has not made a peep to suggest they’ll alter their decades-long overenthusiastic cooperation with the government. Whereas Verizon has been making more audible complaints about their plight, long before the Germans started ending their contracts. And Sprint — unmentioned by Sanger — even demanded to see legal support for turning over phone data, including, apparently, turning over foreign phone data under ECPA;s exception in 18 U.S.C. § 2511(2)(f)‘s permitting telecoms to voluntarily provide foreign intelligence data. Well, if the Microsoft challenge and telecom participation in the request for data overseas is actually an effort to convince the Europeans these corporations are demanding legal process, Admiral Rogers just blew their cover. Admiral Rogers said the majority of corporations that had long given the agency its technological edge and global reach were still working with it, though they had no interest in advertising the fact. Dear Ireland and the rest of Europe: Microsoft — which has long been rather cooperative with NSA, up to and including finding a way to obtain Skype data — may be fighting this data request just for show. Love, Microsoft’s BFF, Mike Rogers. In the post-HR 3361 passage press conference yesterday, Jerry Nadler suggested the only reason civil libertarians oppose the bill is because it does not go far enough. That is, at least in my case, false. While I have concerns about unintended consequences of outsourcing holding the call data to the telecoms (see my skepticism that it ends bulk collection here and my concerns about high volume numbers here), there are a number of ways that USA Freedumber is worse than the status quo. As I have described, the language in USA Freedumber makes it explicit that the government and its telecom partners can chain on connections as well as actual phone call contacts. While the new automatic search process approved by the FISA Court in 2012 included such chaining, by passing this bill Congress endorses this approach. Moreover, the government has never been able to start running such automatic queries; it appears they have to outsource to the telecoms to be able to do so (probably in part to make legal and technical use of location data). Thus, moving the phone chaining to the telecoms expands on the kinds of chaining that will be done with calls. We don’t know all that that entails. At a minimum (and, assuming the standard of proof is rigorous, uncontroversially) the move will allow the government to track burner phones, the new cell phones targets adopt after getting rid of an old one. It also surely involves location mapping. I say that, in part, because if they weren’t going to use location data, they wouldn’t have had to move to the telecoms. In addition, AT&T’s Hemisphere program uses location data, and it would be unrealistic to assume this program wouldn’t include at least all of what Hemisphere already does. But beyond those two functions, your guess is as good as mine. While the chaining must produce a Call Detail Record at the interim step (which limits how far away from actual phone calls the analysis can get), it is at least conceivable the chaining could include any of a number of kinds of data available to the telecoms from smart phones, including things like calendars, address books, and email. The fact that the telecoms and subsidiary contractors get immunity and compensation makes it more likely that this new chaining will be expansive, because natural sources of friction on telecom cooperation will have been removed. On its face, USA Freedumber preserves this counterterrorism focus, requiring any records obtained to be “relevant to” an international terrorist investigation. Unfortunately, we now know that FISC has already blown up the meaning of “relevant to,” making all data effectively relevant. The judicial approval of the specific selection term, however — the court review that should be an improvement over the status quo — is not that tie to terrorism, but evidence that the selection term is a foreign power or agent thereof. Thus, the government could cite narcoterrorism, and use the chaining program to investigate Mexican drug cartels. The government could raise concerns that al Qaeda wants to hack our networks, and use chaining to investigate hackers with foreign ties. The government could allege Venezuela supports terrorism and investigate Venezuelan government sympathizers. There are a whole range of scenarios in which the government could use this chaining program for purposes other than counterterrorism. And once it gets that data, the government can keep it, so long as it claims (to itself, with uncertain oversight from the FISC) that the data has a foreign intelligence purpose. At one level, this is a distinction without a difference from the language that USA Freedumb had used, which required the NSA to destroy the data after five years unless it was relevant to a terrorism investigation (which all data turned over to NSA would be, by definition). But the change in language serves as legislative approval that the use of the data received via this program can be used for other purposes. That will likely have an impact on minimization procedures. Currently, the NSA needs a foreign intelligence purpose to access the corporate store, but can only disseminate data from it for counterterrorism purposes. I would imagine the changed language of the bill will lead the government to successfully argue that the minimization procedures permit the dissemination of US person data so long as it meets only this flimsy foreign intelligence purpose. In other words, US person data collected in chaining would be circulating around the government more freely. As I noted, the revisions USA Freedumber made to USA Freedumb explicitly removed a requirement that emergency queries be tied to a terrorism investigation. That’s particularly troublesome, because even if the FISC rules the emergency claim (certified by the Attorney General) was not legally valid after the fact, not only does the government not have to get rid of that data, but the Attorney General (the one who originally authorized its collection) is the one in charge of making sure it doesn’t get used in a trial or similar proceeding. In short, these three changes together permit the government to use the phone dragnet for a lot more uses than they currently can. When John Bates declared aspects of upstream collection to be unconstitutional in 2011, he used the threat of referrals under 50 USC 1809(a) to require the government to provide additional protection both to entirely domestic communications that contained a specific selector, and to get rid of domestic communications that did not contain that specific selector at all. The government objected (and considered appealing), claiming that because it hadn’t really intended to collect this data, it should be able to keep it and use it. But ultimately, that threat (especially threats tied to the government’s use of this data for ongoing FISA orders) led the government to capitulate. The House Intelligence Committee passed a bill out of its committee Thursday, HR 3361, that will reportedly solve a problem (or problems) the NSA has been struggling with since 2009. The bill will now move to the full House for a vote. The public — and surely a great majority of members of Congress — have no idea precisely what problem this bill will solve is: planted leaks suggest it has to do with difficulties dealing with cell phone records, perhaps because they include location data. If that is part of the problem, then it’s a fairly recent development, perhaps arising after US v. Jones raised new concerns about the legality of collecting location data without a warrant. There’s also the presumably-related issue of an automated query function; NSA has been struggling to resume that function since its alert function got shut down as a legal violation in 2009. The ability to tie multiple identities from the same person together as NSA runs those alerts may be a related issue. The bill does have the critically important effect of ending the government’s practice of collecting and storing some significant portion of all US call records, beyond whatever US person call records it collects overseas. That, by itself, is the equivalent of defusing a nuclear bomb. It is a very important improvement on the status quo. It remains entirely unclear — and unexamined, as far as I can tell — whether the bill will increase or decrease the number of entirely innocent Americans who will be subjected to the full range of NSA’s analytical tradecraft because they got swept up based on the guilt by association principle behind contact-chaining, or whether the bill will actually expose more kinds of US person records to the scrutiny of the NSA. The bill the press is calling USA Freedom Act may also — though we don’t know this either — have the salutary benefit of changing the way the NSA currently collects data under other Section 215, Pen Register, and NSL collection efforts. The bill requires that all Section 215 (both call record and otherwise), Pen Register, and NSL queries be based on a specific selection term that remains vaguely defined (a definition the House Intelligence Committee considered eliminating before Thursday’s hearing). But it remains unclear how much that rule — even ignoring questions about the definition — will limit any current practices. At Wednesday’s hearing Bob Goodlatte said the bill “preserves the individual use of Section 215 under the existing relevancy standard for all business records,” and at least for several NSL authorities, the new “restrictions” almost certainly present no change (and another NSL authority, the Right to Financial Privacy Act, uses the same “entity” language the bill definition does, suggesting it is unlikely to change either). Plus, at least according to DOJ’s public claims and court filings, it ended the bulk domestic collection under PRTT in 2011. So the language “ending” “bulk collection” may do no more than make it harder for FBI to construct its own phone books of phone company and ISP subscribers using NSLs, if it does even that. What the bill doesn’t do — because this part of the bill was stripped as part of the compromise — is provide the Intelligence Community’s oversight committees detailed reports of what kind of records the government obtains under Section 215 (and for what agencies), and how many Americans are subject to all the FISA authorities, including Section 215. That is, the compromise eliminated the one thing that could measure whether the bill really did “end” “bulk collection” as you or I would understand it. In its stead, the bill largely codifies an existing reporting agreement that AT&T has already demonstrated to be completely deceptive. In Wednesday’s hearing, Zoe Lofgren called provider reporting “the canary in the coal mine” the committee would rely on to understand what collection occurred. So this bill that “ends” “bulk collection” still prevents us, or even the oversight committees working in our name, from learning whether it does so. It does, however, have some interesting features, given its other purpose of solving one or more challenges facing the NSA. The first of those is immunity. No cause of action shall lie in any court against a person who produces tangible things or provides information, facilities, or technical assistance pursuant to an order issued or an emergency production required under this section. This is another part of the bill the underlying reasons for which the public, and probably much of Congress, doesn’t understand. At one level, it seems to immunize the process that may have telecoms playing a role the NSA previously did, analyzing the data; it may also pertain to providing NSA access to the telecoms’ physical facilities. But given the background to the move to telecoms — NSA’s legal-technical problems dealing with cell phone data because it ties to location — it is possible the immunity gives the telecoms protection if they use but don’t turn over data they have already, such as location data or even Internet metadata, to perform the interim analysis. Consider how the bill describes the call record query process. So a 2-hop query goes from a “specific selection term” to “the results of the production” to the “call detail record” handed over to the government. While the definition of call detail records clearly prohibits the final production to the government of either content or cell location, nothing in this process description prevents the telecoms from using such things (most Internet metadata is legally content to the telecoms) in that interim hop; indeed, the “results of the production under subclause (I)” available to the telecoms almost certainly would include some of this information, particularly for smart phones. We know the Hemisphere program (the AT&T-specific program for the DEA) uses cell location in its analysis. Remember, too, how NSA is gobbling up smart phone data (including things like address books) in overseas programs; this may permit analysis of similar data — if not collection of it — domestically. So at the very least, this scheme seems to give the NSA access to cell location and possibly a whole lot more data for analysis they otherwise couldn’t get (which David Sanger’s sources confirm). So long as the word “entity” in the definition of specific selection term remains undefined, so long as FISC precedents permit the tapping of entire circuits in the name of collecting on an entity, the government may still be able to collect massive amounts of this data, not actually targeted at a suspect but rather something defined as an entity (in both the existing 215 program and the new call records one the bill retains the “relevant to” language that has been blown up beyond meaning). Finally, consider what happened with Lofgren’s last attempted amendment. After having submitted a number of other failed amendments, Lofgren submitted an amendment to fix what she called an inadvertent error in the manager’s amendment specifically prohibiting the collection of content under Section 215. I believe this amendment fixes — at least I hope — an error that was created in the manager’s amendment that I cannot believe was intended. As you know we have specified that the content is not included in business records. This amendment clarifies that business records do not include the content of communication. We specify that in the new section about call detail records, but but the specification that content was not included somehow got dropped out of the business records section. It was included in your original bill but it didn’t make it into the manager’s amendment. I think this amendment clarifies the ambiguity that could be created and I hope it was not intentional. This is a problem I pointed out here. Almost without missing a beat after she introduced this, Jim Sensenbrenner recessed the hearing, citing votes. While there were, in fact, votes, Luis Pierluisi (who cast the decisive vote in favor of an amendment to redefine counterintelligence) and possibly Lofgren got a lecture at the break about how any such amendments might blow up the deal the Committee had with Mike Rogers and HPSCI. After the break, Lofgren withdrew the amendment, expressing hope it could be treated as a clerical fix. That purported error was not fixed before HPSCI (which explicitly permitted the collection of content under its bill) voted out the bill. Perhaps it will be “fixed” before it comes to the floor. But if it doesn’t, it may expand (or, given Lofgren’s stated concerns about what records Section 215 might cover, sustain) the use of Section 215 to collect content, not just metadata. Imagine the possibility this gets yoked to expanded analysis at telecoms under the new CDR program? We don’t know. This bill has gotten past two committees of Congress (we didn’t get to see any of the debate at HPSCI) without these details becoming clear. But the questions raised by this bill when you consider it as the fix to one or more problems the NSA has been struggling with, it does raise real questions. Again, I don’t want to make light of the one thing we know this bill will do — take a database showing all phone-based relationships in the country out of NSA’s hands. That eliminates an intolerably risky program. That is an important fix. But that shouldn’t lead us to ignore the potential expansion of spying that may come with this bill. As I noted in my last post, DOJ’s Inspector General recently created a page showing their ongoing investigations. It shows some things not described in Inspector General Michael Horowitz’ last report to Congress. Of particular interest is this investigation. The OIG is examining the DEA’s use of administrative subpoenas to obtain broad collections of data or information. The review will address the legal authority for the acquisition or use of these data collections; the existence and effectiveness of any policies and procedural safeguards established with respect to the collection, use, and retention of the data; the creation, dissemination, and usefulness of any products generated from the data; and the use of “parallel construction” or other techniques to protect the confidentiality of these programs. The description doesn’t say it, but this is Hemisphere, the program under which DEA submits administrative subpoenas to AT&T for phone records from any carrier that uses AT&T’s backbone. DEA gets information matching burner phones as well as the call records. In addition, it gets some geolocation — and continued to increase what it was getting even after US v Jones raised concerns about such tracking. The presentation on Hemisphere makes it very clear the government uses “parallel construction” to hide Hemisphere. 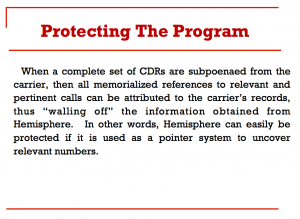 Protecting the Program: When a complete set of CDRs are subpoenaed from the carrier, then all memorialized references to relevant and pertinent calls can be attributed to the carrier’s records, thus “walling off” the information obtained from Hemisphere. In other words, Hemisphere can easily be protected if it is used as a pointed system to uncover relevant numbers. Exigent Circumstances — Protecting the Program: In special cases, we realize that it might not be possible to obtain subpoenaed phone records that will “wall off” Hemisphere. In these special circumstances, the Hemisphere analyst should be contacted immediately. The analyst will work with the investigator and request a separate subpoena to AT&T. 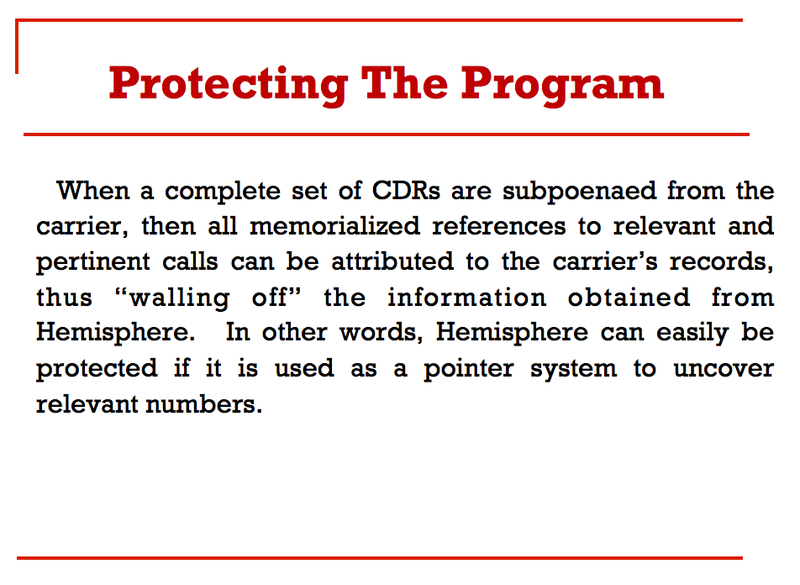 Official Reporting — Protecting the Program: All requestors are instructed to never refer to Hemisphere in any official document. If there is no alternative to referencing a Hemisphere request, then the results should be referenced as information obtained from an AT&T subpoena. And this is not the only area where DEA Is using parallel construction to hide where it gets its investigative leads. Reuters reported in August that DEA also uses parallel construction to hide the leads it gets from purportedly national security-related wiretapping. Presuming that Horowitz is investigating whether DEA’s extensive use of parallel construction complies with the Constitution (and not, as is possible, whether the sources of this information are being adequately buried), this is welcome news indeed. But it’s also one of several reasons why I’m particularly alarmed, in retrospect, that Horowitz is complaining about his ability to get grand jury information without having to get either Attorney General Holder or Deputy Attorney General James Cole to personally approve it. I want to make two more points about AT&T’s “Transparency” Report which, as I mentioned earlier, shows how deceitful “transparency” reports can be. First, compare the number of subpoenas AT&T shows, total, compared to the rough numbers provided for requests to AT&T under Hemisphere for the prior year. 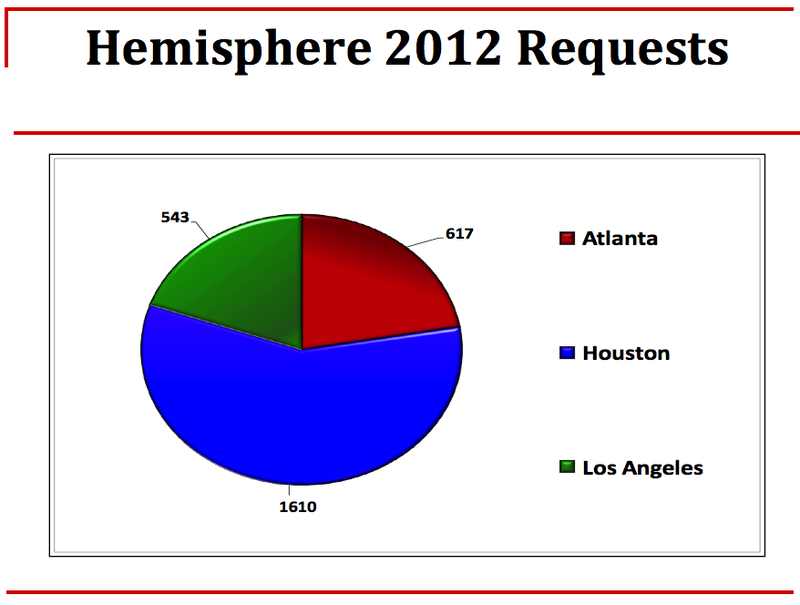 In 2012, 3 cities — Atlanta, Houston, and Los Angeles — submitted a total of 2,770 requests to Hemisphere. In 2012 to 2013 (see the following slide), 7 HIDTAs plus two parts of the Southwest Border HIDTA submitted 838 requests to Hemisphere. While I suspect other HIDTAs also have access to Hemisphere, those numbers are still just a tiny fraction of the total subpoenas AT&T got the following year — using the larger number, just slightly more than 1% of the 223,659 criminal subpoenas AT&T received in 2013. Even assuming the number is 3 times that across all DEA requests, that seems like a miniscule number, probably even a miniscule number of the requests submitted in drug investigations. We are to believe, then, that AT&T keeps up this database just to feed as what might be less than 4% of its total requests? Which is one reason I suspect Hemisphere is also serving other purposes. And that, of course actually assumes (I’m in a generous mood) that AT&T receives a subpoena for all its Hemisphere requests, in spite of references in the Hemisphere presentation to emails and despite the past history of AT&T (or another telecom) providing phone records in response to requests on Post-It notes. Which makes me really wonder, given another little detail in AT&T’s “Transparency” Report, whether AT&T responds to as data requests, rather than formal demands. Remarkably, AT&T has just 22 International Demands, counting both law enforcement and URL blocking. Verizon, by contrast, got 2,396 law enforcement demands and 1,663 block requests, though some of that may reflect Vodapone exposure and it also implies there were other requests that it funneled through MLAT processing. I raise this because, in his paper on the dragnet, David Kris repeatedly suggested the NSA gets some bulk metadata via voluntary production of foreign data. Alternative methods of collection would include non-bulk FISA orders, or what prior NSA Directors in the past have referred to as “vacuum cleaner” surveillance outside the ambit of FISA, under Executive Order 12333 and its subordinate procedures, such as DOD 5240-1.R, and perhaps voluntary production if not otherwise prohibited by law. See NSA End-to-End Review at 15; August 2013 FISC Order at 10 n.10 (“The Court understands that NSA receives certain call detail records pursuant to other authority, in addition to the call detail records produced in response to this Court’s Orders.”); cf. 18 U.S.C. § 2511(2)(f) otherwise applicable Federal law involving a foreign electronic communications system, utilizing a means other than electronic surveillance as defined in section 101 of the Foreign Intelligence Surveillance Act of 1978”). (“Nothing contained in this chapter or chapter 121 or 206 of this title, or section 705 of the Communications Act of 1934, shall be deemed to affect the acquisition by the United States Government of foreign intelligence information from international or foreign communications, or foreign intelligence activities conducted in accordance with otherwise applicable Federal law involving a foreign electronic communications system, utilizing a means other than electronic surveillance as defined in section 101 of the Foreign Intelligence Surveillance Act of 1978”). If AT&T is voluntarily providing data in response to requests, without insisting on getting a demand, it might explain some of the numbers (not to mention its far greater skew towards subpoenas rather than warrants, as compared to Verizon — though this “demand” “request” language necessarily appears at Verizon, too). Don’t get me wrong: if AT&T wants to just give out customer information in response to data requests without asking for a demand, I’ll just assume it’s being polite to those in authority. But if it is, those requests should be in its transparency report too. Responding to a question about recent reports that the NSA collects data on only 20% to 30% of calls involving U.S. numbers, Alexander acknowledged that the agency doesn’t have full coverage of those calls. He wouldn’t say what fraction of the calls NSA gets information on, but specifically denied that the agency is completely missing data on calls made with cell phones. Admittedly, Alexander is not always entirely honest, so it’s possible he’s just trying to dissuade terrorists from using cellphones while the NSA isn’t tracking them. But he points to the same evidence I did — that NSA has gotten key targets who use cell phones. There’s something else Alexander said that might better explain the slew of claims that it can’t collect cell phone data. The NSA director, who is expected to retire within weeks, indicated that some of the gaps in coverage are due to the fact that the NSA “paused any changes to the program” during the recent controversy and discussions about restructuring the effort. The NSA has paused changes to the program. This echoes WaPo and WSJ reports that crises (they cited both the 2009 and current crisis) delayed some work on integrating cell data, but suggests that NSA was already making changes when the Snowden leaks started. There is evidence the pause — or at least part of it — extends back to before the Snowden leak. As I reported last week, even though the NSA has had authority to conduct a new auto-alert on the phone dragnet since November 2012, they’ve never been able to use it because of technical reasons. The Court understands that to date NSA has not implemented, and for the duration of this authorization will not as a technical matter be in a position to implement, the automated query process authorized by prior orders of this Court for analytical purposes. This description actually came from DOJ, not the FISC, and I suspect the issue is rather that NSA has not solved some technical issues that would allow it to perform the auto-alert within the legal limits laid out by the FISC (we don’t know what those limits are because the Administration is withholding the Primary Order Supplement that would describe it, and redacting the description of the search itself in all subsequent orders). Remember, too, there’s a February 2013 FISC Section 215 opinion the Administration is also still withholding, which also might explain some of the “technical-meaning-legal” problems they’re having. Underlying this all (and assuredly underlying the problems with collecting VOIP calls, which are far easier to understand and has been mentioned in some of this reporting, including the LAT story) is a restriction arising from using an ill-suited law like Section 215 to collect a phone dragnet: telecoms can only be obligated to turn over records they actually “already generate,” as described by NSA’s SID Director Theresa Shea. [P]ursuant to the FISC’s orders, telecommunications service providers turn over to the NSA business records that the companies already generate and maintain for their own pre-existing business purposes (such as billing and fraud prevention). To the extent telecoms use SS7 data, which includes cell location, to fulfill their Section 215 obligation (after all, what telecoms need billing records on a daily basis? ), it probably does introduce problems. Which, I suspect, will mean that Alexander and the rest of the dragnet defenders will recommend that a third party collate and store all this data, the worst of all solutions. They need to have a comprehensive source (like Hemisphere apparently plays for the DEA), one that will shield the government from necessarily having collected cell location data that is increasingly legally suspect to obtain. And they’ll celebrate it as a great sop to the civil libertarians, too, when in fact, they’ve probably reached the point where it is clear Section 215 can’t legally authorize what it is they want it to do. The issue, more and more evidence suggests, is that they can’t collect the dragnet data without a law designed to construct the dragnet. Which is another way of saying the dragnet, as intended to function, is illegal.